The last Saturday in October usually found us at the Bristol Road Fall Songfest in Flint Michigan. Accapella, AVB, Echo, Ray Walker, and others. While Gene Collings started the event in the early eighties, Sonny eventually came to be the organizer as well as the Master Of Ceremonies. This footage is from 1990. 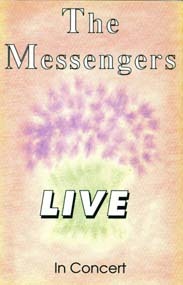 In March 1990 we recorded our Messengers Live project in Ashland Ohio. It was a different kind of night- very informal, and for those present, we were preoccupied with the details required of the evening. Not our best night in terms of creating a spiritual mood, but the end product turned out OK. We sang a first half, a second half, and then a "third half" where we went back and re-sang a few trying to get a better "take" for the recording. Lots of laughs, lots of singing, and truly a night we will never forget! For many years, the third Sunday in July found us at the Little Blue River church out in the cornfields, southeast of Indianapolis. Their forte' was their "Pitch-In Dinners". It was sort of a homecoming family and friends and they would pack out the quaint, old fashioned building with the tin ceiling. The acoustics were great! This footage from July 1991 was David's first trip with us where we introduced him our friends in Rush County. Each summer around the end of July or first week in August we would sing at Spring Road in Westerville Ohio. (just outside of Columbus) There was usually a lot of good natured kidding and rivalry concerning Ohio State and Michigan. This appearance from July 1989 was no different. June 1990 found us in Findlay Ohio one Saturday night singing with Gloryland, the Noise, and some others. Funny moments include Sonny running out of air at the end of the third song of the first half and how he recovered and zinged us. Also as we wrapped up the second half set with "Build An Ark", there was a BIG clap of thunder that could not have been better timed!